The art on this page is mine (very sure of it for the past 11 years). And I sure as hell don't have a brother called Mike who likes to boost he made the art himself. Thanks~! Will be spreading the word to other ppl to be vigilant. Sorry about the lack of submissions, I will continue to submit art here, but not as frequently as I use to (then again, you guys have already noticed that). I will post the "prettier" stuff here. So yep, not completely abandoning the account. Also, I've taken up Monster Hunting on the 3DS. Can't wait for 4 next year! PV5 for JoJo's Bizarre Adventure - All Star Battle game was broadcast outdoors in Tokyo and Osaka yesterday. So much screaming fangirls and guys. Gotta love live hype. You can tell which of these characters and parts are popular with the crowd. Kakyoin @ 7:10~! Someone was going nuts with the screaming there! Continuing into Polnareff. 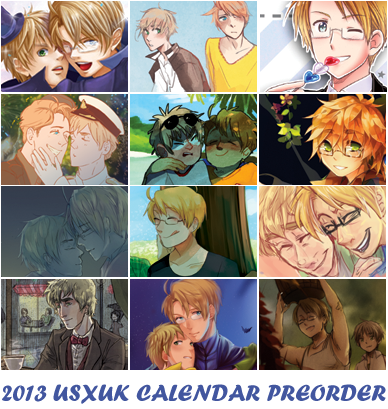 USxUK 2013 Calendar - Half Price sale! Plenty of 2013 USxUK Calendars left over! And now for half the price! Additional news: I am ceasing USUK pchat for now as life is becoming more busy. Also, gotten into JoJo's Bizarre Adventure so USUK fan art will slow to a crawl. HURRY! Pre-orders end by Thursday, November 8th! Also, I uploaded the Britannia Angel comic to dA. Some of you may have already seen it on tumblr and LiveJournal. 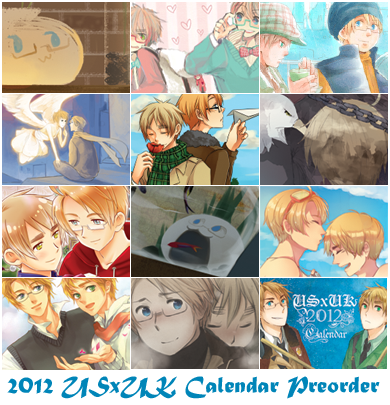 A second chance to purchase the USxUK 2012 calendar if you missed out the first time! HURRY! Pre-orders end by Wednesday, November 30th! HURRY! Pre-orders end by Sunday!! Black Jack Webdoujin Anthology site is now open! It's been a while since I last posted an entry here. This is sorta of a cross-post from my LJ. Also, this is coming from someone who hasn't read the Scott Pilgrim comics yet, but only played the PSN video game. The style, music and energy of this film was great! All the references and sound effects to old skool video games used throughout the film had me in glee! (Zelda, Mario, Street Fighter, and Sonic are the ones I identified. And correct me if I'm wrong, but did they make a NES Duck Tales reference?) Heck, Scott even wore an Astro Boy t-shirt! And I love the humor! XD From the moment that Matthew Patel enters the scene, the film got crazy and exuberant, and a lot of things didn't make a lot of sense from there on, but the film just embraced the craziness. The cast of characters where also brilliant! Those who stood out to me and I became fond of was Knives Chau, Scott's young high school girlfriend whose character I normally would have found annoying, but she actually came across rather endearing thanks to the actress who played her, and Wallace Wells, Scott's suave, laidback and level-headed gay roommate. My gripe with the movie is that we don't get to know all too much Katayanagi Twins, how did Ramona met and split up with them (They didn't speak at all!). Perhaps, provide more build up for Gideon, and have slightly more insight on Scott's past relationship with Envy. My other compliant would have to do with all the craziness; how does Scott know how to fight and why no one seems to have a scratch on them after getting pummelled so much? But then again, I had to chalk this up to the video game aspect of this movie's theme, so perhaps my complaint here is invalid. But other than that, it was a very enjoyable film. I guess I should have started this project sooner when the anime was still be subbed cause I have noticed that slight fall in interest and inactivity with Black Jack around some communities. I'm heading to the London Expo next week Sunday, so anyone else going would be aware that I'll be there and seamlessly blending into the crowd. Really, I'm not exactly a crowd person so I probably won't stick around for too long. ._. ; Not exactly sure what to wear if anyone wants to look for me. A Black Jack shirt perhaps? Yes, I do like USxUK. *Sigh* Why is it too easy? It usually takes me time to get into a couple... This can't be a good sign, is it? B'z news! I'm so behind with B'z! I finally got round to listening to their latest album, "MAGIC", which came out late last year. And I have to admit, it's not so bad, but not great. Yes, only two songs from the album. The other songs aren't bad, but they're not unique enough or memorable, imo, which is quite worrisome. There are also a couple of B'z singles which I caught up with but weren't too keen on them either (though the ballad version of "Ichibu to Zenbu" is very nice. The song has very sweet lyrics). I dunno, it seems like they have been stuck in this particular style of music for a good number of years. Their solo works are great, but when working together, the music they produce seem to have this same sound to them in the last few or so albums... I wonder why? Is it because of age? That they aren't push as much as they use to? Or has the current music scene jaded them to what sounds good? Perhaps all 3? And I actually like "Sahara" featuring Koshi Inaba from Slash's solo album, "SLASH". 1.) Write 10 things about yourself. 2.) When your done, choose 10 other victims' icons and post it in your journal! 3.) Go to your victims page and leave a message saying you tagged them! I'm not gonna do this. 4.) There are no tag backs folks! 1. Good with one-on-one conversations, but in a group I tend to clam up. 3. Finally have a tablet! But for some reason, still love drawing line art on paper. 5. I admit to not liking a large majority of AMVs (Note: Not all, just a lot). There's only been... 2 that I liked. 1 sparked my interest so much that I went and brought the DVD boxset. 6. After much resisting, I finally gave in and watched Hetalia yesterday. 7. I'm a spoonyone fan. 8. Not so fond of taking the bus, I'd rather walk or take the train. 9. I like curry, but can only take it if it's mild. First of all, Happy New Year! Already 2010! I've been mostly working and gluing myself to livejournal, so again, sorry for the lack of artwork. Anyway, on with the meme! 1. Really dislike Caramelldansen. Cannot stand it. 2. Never played an FPS. 3. Have a fondness for old Sega games and consoles. 5. Slowly becoming a fujoshi. But at the same time I don't go over the top. Well, not yet. Well, working mostly, made some lovely new friends, had a couple of reunions, gone to a few events (Video Games Live and Play.com), been posting a little more on my LJ, brought a wii and have been playing a few games on that. It's also been a very family orientated year this year. Art wise, I have been drawing, but most of it isn't exactly worthy to be posted up here as they are largely of sketches. Christmas for me was pretty eventful, all I can say is that it is a pretty unusual Christmas. Think drama. Anyway, that's all I feel like saying for now. Expect more of my infrequent visits and updates on DA. XD; Hope you all had a good Christmas and wish you all a good start to the New Year! Yes, it's an update, but not exactly the start of a frequent return (sorry guys!). But today is special (3rd of November 1928) as it's Tezuka Osamu's Birthday! There's also been a lot of good news lately. Vertical are planning on translating the entire Black Jack manga series next year (FINALLY!!! *________*), there's an Astro Boy movie in the works by IMAGI, there's been exceedingly good reviews for "Ode to Kirihito" released in English (Again, thanks to Vertical) earlier this year, and some kind soul is willing to scanlate Vampire! Good news indeed! And for this special occasion I have posted up a Black Jack and Makube fan comic, which you can read through in my gallery. Happy New Year all! Wish you all the best of luck this year, good health and success! Year 2007. Year of the pig. So the year of the dog (my birth year) is over... and looking at my DA gallery, I only submitted 5 pieces of work over the last year. Eep. XD; Sorry DA & B'z fan viewers. I'll try and submit more this year... I hope. Thanks to those who took the time to read and vote for the entries! I'm so exited about this. XD Since the trilogy had ended, we now have a new cast of characters! Don't forget to check out the promo video! Okay, again I'm sorry for putting off posting, commenting and stuff for ages. But things have been busy and all those excuses I make. Originally TokyoPop were to choose a top 20 for People's Choice, but only 15 entries were chosen because they couldn't find 5 others that were up to standard for showcasing. Then, they decided to take out :devifuurin: entry: Another Summer Day O_O;; Now that was pretty cruel, especially to do that on the day when the voting page is finally up (but that's been delayed for a week due to site maintenance)... But I hope fuurin won't be discouraged from entering for next year's competition. Best of luck to her! Now on to the topic of Giant Robo (w00t!). My entry "Let's Collab!" is one (out of 5) of this year's NEO Magazine (UK's only anime, manga mag) Manga competition winners. And the manga entry is out in this month's issue (#23). Really. The guy asking for your help is the highlight of the video. XD But you really gotta wonder why everyone is gonna riot in front of a Pepsi Vending machine when there is plenty of Pepsi trucks and cans laying around everywhere. Whoa! Sorry if I still haven't commented back on all your work and comments! I finally got my Uni work up for the exhibition and still have a few more things to organise, so I'm still busy. The London Expo was fun, for at least 3 hours (I'll provide photos at a later date since they're with my bro). XD; There was a huge load of people turning up this year, and my gosh was there a huge queue to get in! @_@ Got to play Phoenix Wright (can't help but keep calling it Gyakuten Saiban...) for a long half hour. The English names still erk me. XD; Brought some Sweatdrop comics and the English release of Tetsujin 28 DVD, which I brought just to hear what the English dub is like. Sorry If I couldn't catch anyone at the Expo this time round, hopefully I'll get to see you all at October's. Feb 3, 2013 USxUK 2013 Calendar - Half Price sale! Jun 15, 2012 Thank you~! 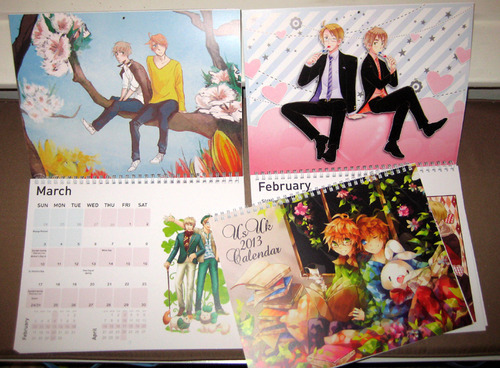 Nov 14, 2011 USxUK 2012 Calendar Reprint! Dec 29, 2008 Hi all! Jul 14, 2006 Pepsi Man!